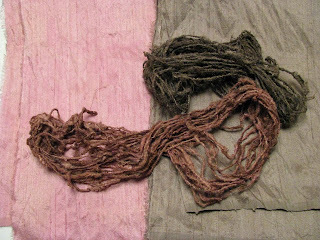 Here is a photo of the quebracho dyed silk pieces, the wool and the cotton didn't take the dye very well - or at all in my opinion! Anyway, the colors are very nice, not what I expected at all. Silk Dupioni fabric and Raw Silk Muga yarn are the samples here using Q. Red and Q. Black in seperate vats. Maybe I should combine the two vats for a third color - who knows maybe I'll finally get the color I've been striving for~!